Must Sell by April 1st ! Brand new engine this year 2014. Added 3 new Cadet 750 Watt heaters 2013. Electric and propane heating system. On demand propane water heater new in 2012 mounted outside on the aft deck bulkhead. Bank of 4 new batteries in center pontoon storage. Handling of this vessel is equivalent to a large motorhome. New aluminum decking and 3 layers of fiberglass enhance the structural integrity of this floating oasis. A 3rd pontoon was added to the middle of the boat to increase storage capabilities and buoyancy. Access is via a floor level hatch located outside the bathroom entryway. The new decking/center pontoon and additional fiberglass coating was added after the boat was dropped in the yard during repairs. It has since been restored to better than when it left the showroom floor including new floor coverings. 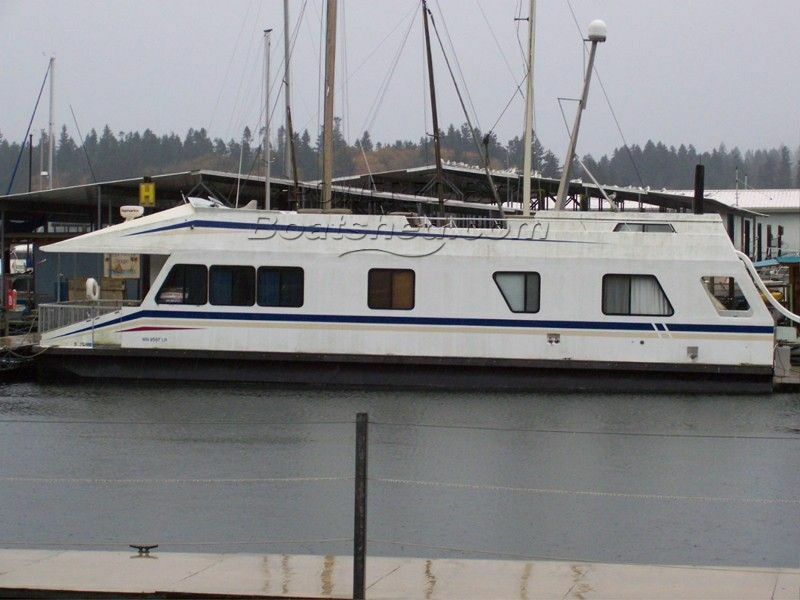 Built By a central British Columbia company (family-owned since 1968) and still thriving today, this boat was one of the boats built in its 3rd line known as the "Voyager" series. New bottom job and outdrive service just done! There is a small area on the aft deck where the plywood floor needs to be replaced but it appears to be a short day job and not extensive. As you enter the forward cabin you find an open and spacious living room. Located starboard forward is the helm. As you walk aft you see the living room joined to a well-appointed u-shaped galley. Across from the galley are twin refrigerators flanked by ample storage. Aft of the refrigerators you find the space for a saloon/dining table. Further aft of the galley, on the port side is a full-sized head. Just above the head entrance is a secondary micro cabin (loft) capable of sleeping 4 adults. Across from the head is the laundry and additional storage. Following the passageway aft you enter the master bedroom which you can also access from the aft deck. The aft deck is complete with its very own fueling station for personal watercraft. Entering the starboard access on the aft deck you walk up to an open upper deck. The available space on this upper deck is enough to entertain guests for any event. A dip in the water is facilitated by a water slide on the port aft corner of the upper deck. If you feel like lounging and having a drink at the upper deck bar there is plenty of room for relaxation. Electric cabin heating system (Cadet heaters) new in 2013. This Aluminium Pontoon House Boat has been personally photographed and viewed by Gary Buck of Boatshed Tacoma. Click here for contact details.